The VariGrip Therapy is the only exerciser with patented ability to adjust tension in each individual finger. Because not all fingers have equal strength, each single finger knob can easily be adjusted. A simple wheel allows you to adjust the resistance for each finger. In addition, resistance can be increased incrementally on the patient’s need, which minimises overcompensation and strain. 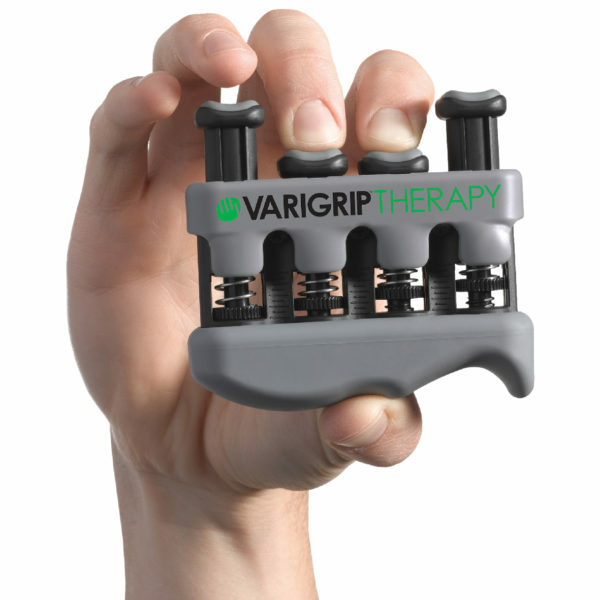 As a result, the VariGrip allows the patient to progress steadily between resistance levels. 5 different resistance levels are available. Each Varigrips highest resistance ends where the next resistance starts. In contrast, any other hand exerciser increases from Light (1,4kg) to Medium (2,3kg). That’s almost a 70% increase gap, which can cause an overload on the muscles, resulting in injuries. Therefore, the seamless progress from one VariGrip to the other, supported by the padded finger and palm area, guarantees a safe recovery and better feel for those with sensitivity issues. Not all fingers are equal! Find all our Hand Exercise products here.